I see many homes that the owners would like to sell that have terrible Do-It-Yourself (DIY) jobs that were botched by the homeowners themselves. In general the bigger and more complex the job is, the more a normal homeowner should reconsider a DIY approach. 1. Do I have the necessary tools? Many jobs that you see professionals doing also involve professional tools that the normal homeowner likely doesn’t have. If your toolbox consists of a hammer, a couple of screw drivers and a pair of pliers; then almost all of the jobs in your home should be farmed out to professionals. 2. Do I have the necessary skills? Even if you took a Saturday class at Home Depot on how to install tile around a bathtub; think twice (maybe thrice) before tackling such a highly visible and difficult job. Maybe you can put tile down in your small laundry room to test your skills. At least it is not in a highly visible area if you mess it up. Don’t try your skills first in your front foyer. 3. Do I have the time and patience? Most DIY jobs that homeowners attempt will take far longer than initially planned (or what the guy at Home Depot told you it would take) and many will offer challenges to your patience and persistence. 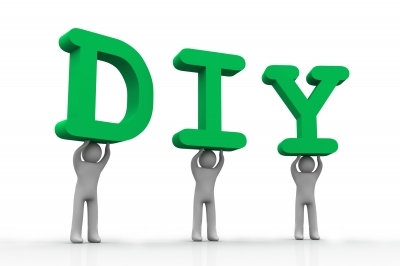 If you have any Attention Deficit Disorder left in you from childhood, DIY projects can be very frustrating. 4. Do you have a good sense of style? Sometimes called fashion sense, this is your ability to put colors or shapes together in a way that is pleasing to the eye, not jarring or glaring. This is a tough one for many, since few people have a good feel for their own sense of fashion or style. Some have a sense of style, but it is so off-kilter that it puts off others. I have often seen what passes for a sense of Victorian Style in some homeowners turn into nightmarish jumbles of colors and eclectic furniture pieces. Obviously all of these requirements for a good job can usually be assured by hiring professionals to do the design and installation work for whatever project one has in mind. Sure, it’s more costly to have a pro do the job; however, in the long run it may actually save you money, when it comes time to sell. Would be buyers make lists (mental or otherwise) of all of the things that they will need to tear out and redo. Most of the time those are lists of things that were poorly executed DIY projects. That list of projects for the buyer drives their offer pricing, since they subtract those costs from what they might have offered, had the jobs been done right at the time. The other issues on some projects are health and safety. Many DIY projects that involve tackling the home’s electrical or plumbing systems can result in either, or both, health or safety issues. Improperly installed electrical outlets or switches can be a fire or shock hazard. Plumbing that is not properly installed almost always leaks and those leaks can cause many problems, such as mold. Getting back to the simple task of painting a room; even this little DIY job has a whole list of skills and tools and sense of fashion involved that may be beyond the average homeowner. Certainly, just the prep work that should be done before the brush or roller ever touched any paint will test your patience and persistence. It takes professional painters years of practice to be able to use a brush to paint along the wall-ceiling interface of around a window frame in a nice straight line, without overlapping from one surface to another. Most DIY’ers use painter’s masking tape; which is OK if you get a good quality tape and have the patience to apply properly. I see messy looking DIY paint jobs all the time in houses that the owners were trying to prep for sale. So, am I saying that the homeowner should never do it themselves? No! I am saying that the homeowner needs to take stock of their inventory of tools, skills, mental state and fashion sense before tackling each job that they see needs to be done. Homeowners are all over the spectrum in those four categories. If you have all four for the task at hand, go for it. If not, call a pro. You’ll be happy that you did and some future buyer of your home will be, too. This entry was posted on Monday, December 16th, 2013 at 3:01 pm and is filed under Real Estate. You can follow any responses to this entry through the RSS 2.0 feed. You can leave a response, or trackback from your own site. Very good website you have here but I was wanting to know if you knew of any community forums that cover the same topics discussed in this article?